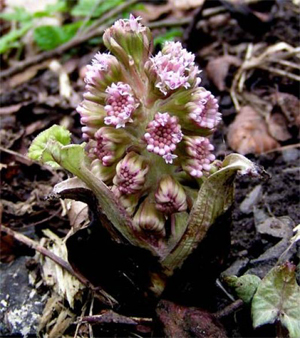 Butterbur is a thick-stalked perennial plant that appears in early spring. A little later come the flowers, preceding the leaves and gathered in dense pinkish clusters. Bees love them for their nectar. The leaves themselves are kidney-shaped, rough toothed and large, their undersides are white. The lower part being divided into 2 round parts, close almost together, pale green and hairy underneath. The root is long, and spreads under the ground, being in some places no bigger than ones finger, in others much bigger, blackish on the outside, and whitish inside. The taste is bitter and unpleasant. The flower blooms and decays in February and March before the leaves appear in April. 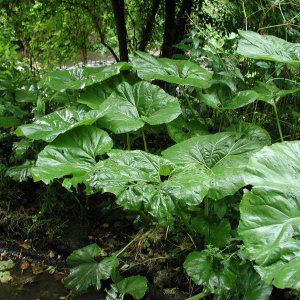 Butterbur is quite harmless and non-poisonous. But the tincture may be too strong for some people. If unusual symptoms occur, reduce the dosage or dilute the dosage and the symptoms will disappear. A general tonic, stimulating the heart and kidneys. Reduces tumors, even cancers, so it is claimed. Has been used to treat depression, dropsy, obesity, Hodgkin’s disease, plague, fevers, kills flat and broad worms, increases urine output, sores that are hard to cure, asthma, migraine, menstrual cramps, spasms, and cures addiction to pain-killing drugs. No known side-effects, even in large doses over a long period of time. Petaforce is a harmless, non-toxic plant remedy to help cancer patients, even if they are on chemotherapy. Petaforce alleviates the unbearable pain suffered by cancer patients in the advanced stage of the illness, when morphine injections begin to fail. The Nature Doctor states that it reduces the danger of metastasis, improves the patient’s condition and prospects of a cure, and makes the existing pain more endurable.